Stunning vistas of the mountains, impeccable service, and classic Pahadi hospitality all come together with a superb flourish at The Kumaon, an indulgent retreat nestled in a hidden nook in Kasar Devi, a ridge above the historical city of Almora. 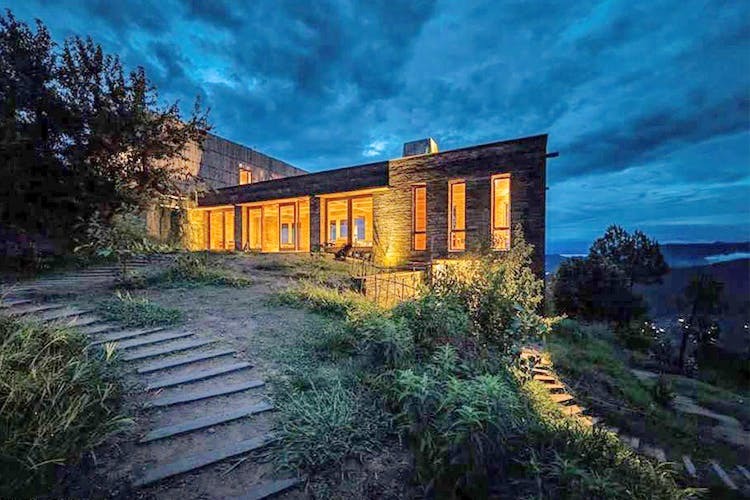 The Kumaon traces its aesthetic lineage to the illustrious architect Geoffrey Bawa, and his disciples have translated the ethos of tropical modernism into a spectacular mountain design. The attention to detail is evident, as each element pair’s contemporary comfort with a natural vibe. Stone interiors in dark colours with a lot of wood inserts, make for perfect winter wonderlands. The bathrooms are straight out of celebrity Instagram shots. Spaciously constructed, the rooms here could give 5-star resorts a run for their money. They always say that memories are constructing around smell and the rooms here have the distinct fragrance of cedar wood and lemongrass that give them a very spa-like vibe. All the villas are constructed to face the valley beyond. The Kumaon has an incredible sunny terrace and nothing is more relaxing than staring into the starry skies with a warm cup of wild thyme tea in your hand here. When it comes to the food, most ingredients are grown on the property and the food has a delicious freshness. From freshly-squeezed watermelon juice to start your day, to a robust mutton curry to end it, the exquisite dining area doubles up as a gourmet restaurant that is likely to please the fussiest of eaters. Breakfast is special, and features everything from soft pancakes with fresh jam to fluffy uttapams with delicious coconut chutney! Our favourite though was a local Kumaoni meal that we requested for- earthy, rustic and divine- it featured a hemp chutney, the local Gehat ki Daal and Chaulaai Ka Saag and Crisp Maduwe Rotis to polish if all off with. If you’re looking to snuggle up with a good book and take deep breaths of mountain air with stunning scenery right out of a National Geographic magazine as you reside in the most incredibly designed rooms- this will be your paradise.